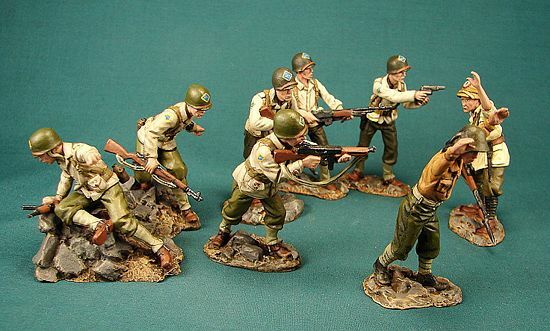 World War II - 60mm (1:30) Scale Vehicles and Figures made in Argentina. Ideal for use with King and Country. "Barkmann's Corner", Le Lorey, Normandy, 1944. Early in July, 1944, SS-Unterscharfuhrer Ernst Barkmann and the 2nd SS Panzer Division Das Reich were sent to Saint Lo to halt the US advance into France. Barkmann saw action throughout the month. One Panther V that he commanded was hit by an anti-tank gun which caused fire. He decided to abandon his burning Panther and along with his crew he quickly put out the fire. Another Panther V Barkmann was in had engine problems and ended up in the field workshop. When Allied fighter-bombers attacked the workshop on July 26th, Barkmann's Panther was hit in the engine compartment. By the next morning, the mechanics had his Panther repaired, but he had been cut off from the rest of his Kompanie. As he hurried to rejoin it, Barkmann was stopped by retreating German infantrymen who reported that Americans were closing in. Two of Barkmann's men investigated, finding an American column made up of some 15 Shermans and other vehicles approaching. Barkmann moved his tank towards a crossroad where he positioned his Panther under the cover of oak trees. When the American column approached, Barkmann opened fire, knocking out two leading tanks and then a tanker truck. Two Shermans attempted to maneuver around the burning wreckage that blocked the road. Barkmann destroyed them both. At this point the Americans pulled back and called in air support. The air attack wounded some of Barkmann's crew members and blew a track from the Panther and damaged the ventilation system. Two Sherman's tried to surprise the damaged Panther, but Barkmann stubbornly knocked them out. His crew quickly repaired their Panther and knocked out one last Sherman while retreating to the safety of the village of Neufbourg. Ernst Barkmann was decorated with the Knights Cross of the Iron Cross on August 27, 1944 for his achievements. Retired by Honour Bound, limited stock available. Please note on this item free shipping does not apply to International Destinations.